Cricket is a great sport: it’s very social, but at the same time players develop ball skills as well as strategic thinking. Better still, it doesn’t take as long as you think in the Junior grades. Parents actually have a great time chilling out in the sun. 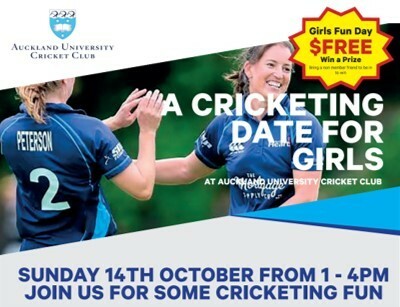 The Auckland University Cricket Club invite you to join us on Sunday 14 October 1-4pm for some cricket fun. While this event has a focus for girls, boys are very welcome but we ask that you "bring a girl" with you, and introduce her to cricket. She can be a sister, cousin, family friend, neighbour, a “friend girl” – whoever you can think of! There will be lots of fun cricket games, mini tournament, free sausages, and a chance to win a prize. Parents: Chill out with us on the last day of the holidays, or you are welcome to join in with the kids.